Palazzo Pescatore in St Paul's Bay. 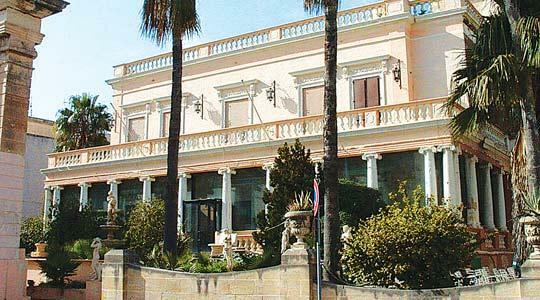 Palazzo Pescatore in St Paul's Bay was built at the end of the 19th century and its symmetrical porticoed façades of neo-classical inspiration are similar to those of Palazzo Dragonara at St Julians. The building is on two floors and is characterised by a verandah all around consisting of a colonnade in the Ionic order which was closed off by glass panels during the 1980s. The upper floor has a series of windows with moulded surrounds. The palazzo used to be surrounded by a garden containing fountains and other embellishments, some of which are recent additions. Much of these gardens have now been re-developed. The interior was largely altered during the past decades when it was used as a nightclub. A neo-classical gate with engaged Ionic columns stands at the entrance to the complex and is a landmark in its own right. Mepa scheduled Palazzo Pescatore and its grounds as a Grade 2 building of architectural importance as per Government Notice number 492/06 in the Government Gazette dated June 6, 2006.